The existence of electricity, the phenomenon associated with stationary or moving electric charges, has been known since the Greeks discovered that amber, rubbed with fur, attracted light objects such as feathers. Ben Franklin proved the electrical nature of lightning (the famous key experiment) and also established the conventional use of negative and positive types of charges. It was also known that certain materials blocked electric charge, called insulators, such as glass or cork. Other materials transfered electric charge with ease, called conductors, such as metal. By the 18th century, physicist Charles Coulomb defined the quantity of electricity later known as a coulomb, and determined the force law between electric charges, known as Coulomb's law. Coulomb's law is similar to the law of gravity in that the electrical force is inversely proportional to the distance of the charges squared, and proportional to the product of the charges. By the end of the 18th century, we had determined that electric charge could be stored in a conducting body if it is insulated from its surroundings. The first of these devices was the Leyden jar. consisted of a glass vial, partly filled with sheets of metal foil, the top of which was closed by a cork pierced with a wire or nail. To charge the jar, the exposed end of the wire is brought in contact with a friction device. Modern atomic theory explains this as the ability of atoms to either lose or gain an outer electron and thus exhibit a net positive charge or gain a net negative charge (since the electron is negative). Today we know that the basic quantity of electric charge is the electron, and one coulomb is about 6.24x1018 electrons. The battery was invented in the 19th century, and electric current and static electricity were shown to be manifestations of the same phenomenon, i.e. current is the motion of electric charge. Once a laboratory curiosity, electricity becomes the focus of industrial concerns when it is shown that electrical power can be transmitted efficiently from place to place and with the invention of the incandescent lamp. The discovery of Coulomb's law, and the behavior or motion of charged particles near other charged particles led to the development of the electric field concept. A field can be considered a type of energy in space, or energy with position. A field is usually visualized as a set of lines surrounding the body, however these lines do not exist, they are strictly a mathematical construct to describe motion. Fields are used in electricity, magnetism, gravity and almost all aspects of modern physics. An electric field is the region around an electric charge in which an electric force is exerted on another charge. Instead of considering the electric force as a direct interaction of two electric charges at a distance from each other, one charge is considered the source of an electric field that extends outward into the surrounding space, and the force exerted on a second charge in this space is considered as a direct interaction between the electric field and the second charge. Magnetism is the phenomenon associated with the motion of electric charges, although the study of magnets was very confused before the 19th century because of the existence of ferromagnets, substances such as iron bar magnets which maintain a magnetic field where no obvious electric current is present (see below). Basic magnetism is the existence of magnetic fields which deflect moving charges or other magnets. Similar to electric force in strength and direction, magnetic objects are said to have `poles' (north and south, instead of positive and negative charge). However, magnetic objects are always found in pairs, there do not exist isolated poles in Nature. The most common source of a magnetic field is an electric current loop. The motion of electric charges in a pattern produces a magnetic field and its associated magnetic force. Similarly, spinning objects, like the Earth, produce magnetic fields, sufficient to deflect compass needles. Today we know that permanent magnets are due to dipole charges inside the magnet at the atomic level. A dipole charge occurs from the spin of the electron around the nucleus of the atom. Materials (such as metals) which have incomplete electron shells will have a net magnetic moment. If the material has a highly ordered crystalline pattern (such as iron or nickel), then the local magnetic fields of the atoms become coupled and the material displays a large scale bar magnet behavior. Although conceived of as distinct phenomena until the 19th century, electricity and magnetism are now known to be components of the unified theory of electromagnetism. A connection between electricity and magnetism had long been suspected, and in 1820 the Danish physicist Hans Christian Orsted showed that an electric current flowing in a wire produces its own magnetic field. Andre-Marie Ampere of France immediately repeated Orsted's experiments and within weeks was able to express the magnetic forces between current-carrying conductors in a simple and elegant mathematical form. 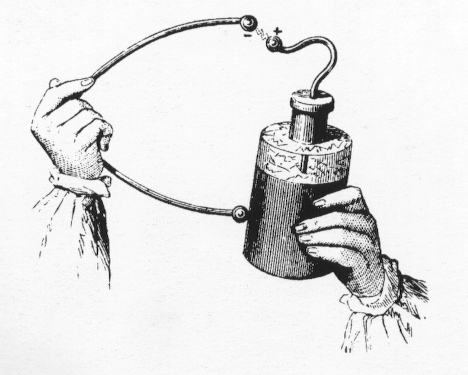 He also demonstrated that a current flowing in a loop of wire produces a magnetic dipole indistinguishable at a distance from that produced by a small permanent magnet; this led Ampere to suggest that magnetism is caused by currents circulating on a molecular scale, an idea remarkably near the modern understanding. Faraday, in the early 1800's, showed that a changing electric field produces a magnetic field, and that vice-versus, a changing magnetic field produces an electric current. An electromagnet is an iron core which enhances the magnetic field generated by a current flowing through a coil, was invented by William Sturgeon in England during the mid-1820s. It later became a vital component of both motors and generators. The unification of electric and magnetic phenomena in a complete mathematical theory was the achievement of the Scottish physicist Maxwell (1850's). In a set of four elegant equations, Maxwell formalized the relationship between electric and magnetic fields. In addition, he showed that a linear magnetic and electric field can be self-reinforcing and must move at a particular velocity, the speed of light. Thus, he concluded that light is energy carried in the form of opposite but supporting electric and magnetic fields in the shape of waves, i.e. self-propagating electromagnetic waves. In doing this, Maxwell moved physics to a new realm of understanding. By using field theory as the core to electromagnetism, we have moved beyond a Newtonian worldview where objects change by direct contact and into a theory that uses invisible fields. This introduces a type of understanding which can only be described with a type of mathematics that cannot be directly translated into language. In other words, scientists where restricted in talking about electromagnetic phenomenon strictly through the use of a new type of language, one of pure math. Electromagnetic radiation is energy that is propagated through free space or through a material medium in the form of electromagnetic waves, such as radio waves, visible light, and gamma rays. The term also refers to the emission and transmission of such radiant energy. The wavelength of the light determines its characteristics. For example, short wavelengths are high energy gamma-rays and x-rays, long wavelengths are radio waves. The whole range of wavelengths is called the electromagnetic spectrum. In 1887 Heinrich Hertz, a German physicist, provided experimental confirmation of Maxell's ideas by producing the first man-made electromagnetic waves and investigating their properties. Subsequent studies resulted in a broader understanding of the nature and origin of radiant energy. It has been established that time-varying electric fields can induce magnetic fields and that time-varying magnetic fields can in like manner induce electric fields. Because such electric and magnetic fields generate each other, they occur jointly, and together they propagate as electromagnetic waves. An electromagnetic wave is a transverse wave in that the electric field and the magnetic field at any point and time in the wave are perpendicular to each other as well as to the direction of propagation. In free space (i.e., a space that is absolutely devoid of matter and that experiences no intrusion from other fields or forces), electromagnetic waves always propagate with the same speed--that of light (299,792,458 m per second, or 186,282 miles per second)--independent of the speed of the observer or of the source of the waves. Electromagnetic radiation has properties in common with other forms of waves such as reflection, refraction, diffraction, and interference. Moreover, it may be characterized by the frequency with which it varies over time or by its wavelength. Electromagnetic radiation, however, has particle-like properties in addition to those associated with wave motion. It is quantized in that for a given frequency , its energy occurs as an integer times h , in which h is a fundamental constant of nature known as Planck's constant. A quantum of electromagnetic energy is called a photon. Visible light and other forms of electromagnetic radiation may be thought of as a stream of photons, with photon energy directly proportional to frequency. Electromagnetic radiation spans an enormous range of frequencies or wavelengths, as is shown by the electromagnetic spectrum. Customarily, it is designated by fields, waves, and particles in increasing magnitude of frequencies--radio waves, microwaves, infrared rays, visible light, ultraviolet light, X rays, and gamma rays. The corresponding wavelengths are inversely proportional, and both the frequency and wavelength scales are logarithmic. Electromagnetic radiation of different frequencies interacts with matter differently. A vacuum is the only perfectly transparent medium, and all material media absorb strongly some regions of the electromagnetic spectrum. For example, molecular oxygen (O2), ozone (O3), and molecular nitrogen (N2) in the Earth's atmosphere are almost perfectly transparent to infrared rays of all frequencies, but they strongly absorb ultraviolet light, X rays, and gamma rays. The frequency (or energy equal to hv) of X rays is substantially higher than that of visible light, and so X rays are able to penetrate many materials that do not transmit light. Moreover, absorption of X rays by a molecular system can cause chemical reactions to occur. When X rays are absorbed in a gas, for instance, they eject photoelectrons from the gas, which in turn ionize its molecules. If these processes occur in living tissue, the photoelectrons emitted from the organic molecules destroy the cells of the tissue. Gamma rays, though generally of somewhat higher frequency than X rays, have basically the same nature. When the energy of gamma rays is absorbed in matter, its effect is virtually indistinguishable from the effect produced by X rays. There are many sources of electromagnetic radiation, both natural and man-made. Radio waves, for example, are produced by cosmic objects such as pulsars and quasars and by electronic circuits. Sources of ultraviolet radiation include mercury vapor lamps and high-intensity lights, as well as the Sun. The latter also generates X rays, as do certain types of particle accelerators and electronic devices. Reflection is the abrupt change in the direction of propagation of a wave that strikes the boundary between different mediums. At least part of the oncoming wave disturbance remains in the same medium. Regular reflection, which follows a simple law, occurs at plane boundaries. The angle between the direction of motion of the oncoming wave and a perpendicular to the reflecting surface (angle of incidence) is equal to the angle between the direction of motion of the reflected wave and a perpendicular (angle of reflection). Reflection at rough, or irregular, boundaries is diffuse. The reflectivity of a surface material is the fraction of energy of the oncoming wave that is reflected by it. Refraction is the change in direction of a wave passing from one medium to another caused by its change in speed. For example, waves in deep water travel faster than in shallow; if an ocean wave approaches a beach obliquely, the part of the wave farther from the beach will move faster than that closer in, and so the wave will swing around until it moves in a direction perpendicular to the shoreline. The speed of sound waves is greater in warm air than in cold; at night, air is cooled at the surface of a lake, and any sound that travels upward is refracted down by the higher layers of air that still remain warm. Thus, sounds, such as voices and music, can be heard much farther across water at night than in the daytime. The electromagnetic waves constituting light are refracted when crossing the boundary from one transparent medium to another because of their change in speed. A straight stick appears bent when partly immersed in water and viewed at an angle to the surface other than 90. A ray of light of one wavelength, or color (different wavelengths appear as different colors to the human eye), in passing from air to glass is refracted, or bent, by an amount that depends on its speed in air and glass, the two speeds depending on the wavelength. A ray of sunlight is composed of many wavelengths that in combination appear to be colorless; upon entering a glass prism, the different refractions of the various wavelengths spread them apart as in a rainbow. Diffraction is the spreading of waves around obstacles. Diffraction takes place with sound; with electromagnetic radiation, such as light, X-rays, and gamma rays; and with very small moving particles such as atoms, neutrons, and electrons, which show wavelike properties. One consequence of diffraction is that sharp shadows are not produced. The phenomenon is the result of interference (i.e., when waves are superimposed, they may reinforce or cancel each other out) and is most pronounced when the wavelength of the radiation is comparable to the linear dimensions of the obstacle. When sound of various wavelengths or frequencies is emitted from a loudspeaker, the loudspeaker itself acts as an obstacle and casts a shadow to its rear so that only the longer bass notes are diffracted there. When a beam of light falls on the edge of an object, it will not continue in a straight line but will be slightly bent by the contact, causing a blur at the edge of the shadow of the object; the amount of bending will be proportional to the wavelength. When a stream of fast particles impinges on the atoms of a crystal, their paths are bent into a regular pattern, which can be recorded by directing the diffracted beam onto a photographic film. Planck was led to this radically new insight by trying to explain the puzzling observation of the amount of electromagnetic radiation emitted by a hot body and, in particular, the dependence of the intensity of this incandescent radiation on temperature and on frequency. The quantitative aspects of the incandescent radiation constitute the radiation laws. The Austrian physicist Josef Stefan found in 1879 that the total radiation energy per unit time emitted by a heated surface per unit area increases as the fourth power of its absolute temperature T (Kelvin scale). This means that the Sun's surface, which is at T = 6,000 K, radiates per unit area (6,000/300)4 = 204 = 160,000 times more electromagnetic energy than does the same area of the Earth's surface, which is taken to be T = 300 K. In 1889 another Austrian physicist, Ludwig Boltzmann, used the second law of thermodynamics to derive this temperature dependence for an ideal substance that emits and absorbs all frequencies. Such an object that absorbs light of all colors looks black, and so was called a blackbody. 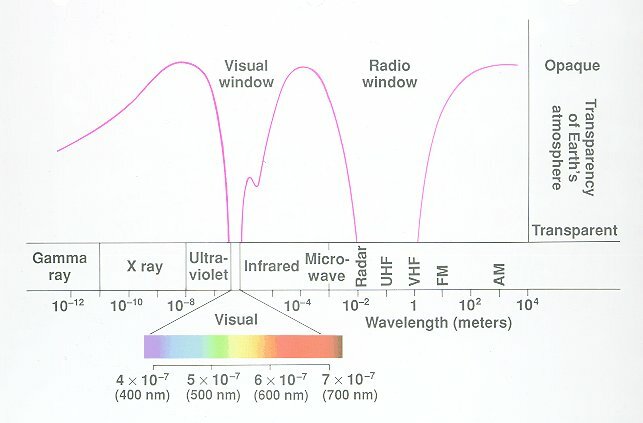 The wavelength or frequency distribution of blackbody radiation was studied in the 1890s by Wilhelm Wien of Germany. It was his idea to use as a good approximation for the ideal blackbody an oven with a small hole. Any radiation that enters the small hole is scattered and reflected from the inner walls of the oven so often that nearly all incoming radiation is absorbed and the chance of some of it finding its way out of the hole again can be made exceedingly small. The radiation coming out of this hole is then very close to the equilibrium blackbody electromagnetic radiation corresponding to the oven temperature. Wien found that the radiative energy dW per wavelength interval d has a maximum at a certain wavelength m and that the maximum shifts to shorter wavelengths as the temperature T is increased, as illustrated in the figure below. Wien's law of the shift of the radiative power maximum to higher frequencies as the temperature is raised expresses in a quantitative form commonplace observations. Warm objects emit infrared radiation, which is felt by the skin; near T = 950 K a dull red glow can be observed; and the color brightens to orange and yellow as the temperature is raised. The tungsten filament of a light bulb is T = 2,500 K hot and emits bright light, yet the peak of its spectrum is still in the infrared according to Wien's law. The peak shifts to the visible yellow when the temperature is T = 6,000 K, like that of the Sun's surface.